Today, few people laugh at the idea of investing in cryptocurrency. Bitcoin is soaring, bouncing around $4,200 for the last several months. Other major coins — Ethereum, Ripple, and even Litecoin — have also risen in value dramatically. Even the finance show pundits are starting to take crypto investments seriously. Perhaps that’s why those same finance experts and analysts have been so quiet when it comes to the booming ICO scene. It’s not that they don’t understand the concept of an initial coin offering as a funding method — it’s essentially just another kind of IPO — but rather that they don’t want to risk another hit to their credibility. They’ve barely mastered the terminology of bitcoin, and rather than delve into the complexities of Ethereum-derived assets and digital exchanges, it’s easier to just opine about the movements of the Dow and the S&P. While some mainstream publications have examined the topic in some detail — Fortune, for instance — there’s still more than a little skepticism in financial media about ICOs. The subtext is hard miss: The crypto world is filled with scams, and even though ICOs offer a previously unthinkable level of transparency and near-instant settlement options, there must be something shady going on. This bias could soon be a real problem. 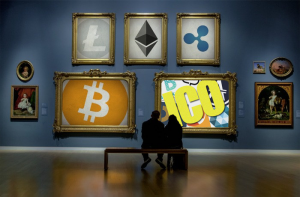 ICOs are fast becoming a key funding method for startups across the globe. What established cryptocurrency investors see as an evolution of blockchain technology is often being dismissed out of hand as a “effectively a Kickstarter campaign” for early stage blockchain projects. Instead of recognizing the true potential — and the rapidly changing reality — of ICOs, it’s easier just to downplay their impact. At the same time, ICOs don’t seem to be going away. Just like their more established crypto cousins, ICO represent a truly disruptive force in the finance world. Even the SEC’s recent announcement that some ICOs could be regulated as traditional securities hasn’t diminished investor appetite. We’re still in the earliest of early days when it comes to blockchain-based investments. At the time of this writing, the total market cap for non-currency cryptoassets was a mere $8.7 billion, which is far less than the $9.2 billion valuation of a single high-profile tech startup like Square (SQ). Given the global, frictionless nature of cryptoassets, and the opportunities presented by a growing range of ICO options, there’s plenty of room for growth. With new crowdsales and ICOs happening every day, maybe it’s finally time for the rest of us to start taking crypto-based investment seriously.